Caption slip reads: "Photographer: Brunk. Date: 08-30. Reporter: Rose. Assignment: Chino convict shot. "37, 38: Lt. to Rt. : Sheriff Sgt. Fred Staebler and Deputy Max E. Krukow, of Firestone Substation, view body of John Kay, 23, Chino escapee, shot as trespasser. 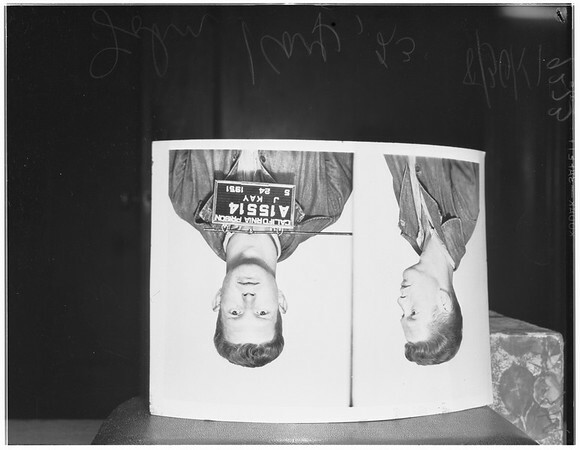 39-40: Charles H. Fuson, 51, points to hole in window (shade) with .38 caliber colt with which he fatally shot John Kay, 45-46: Copy of Kay's mug shot. Daily News".